Wahama senior Destiny Sayre bumps a ball in the air during Game 2 of Wednesday night’s non-conference volleyball match against Hannan in Mason, W.Va.
Hannan’s Hannah Carrol (18) bumps the ball in the air during Game 2 of Wednesday night’s non-conference volleyball match against Wahama in Mason, W.Va.
MASON, W.Va. — A fitting farewell … even though they’ll be back. The Wahama volleyball team celebrated Senior Night in style on Wednesday following a 25-16, 25-9, 25-13 victory over visiting Hannan in a non-conference battle between Mason County programs at Gary Clark Court. The Lady Falcons (5-18) never trailed in the entire match as the hosts led wire-to-wire in the final two games and also broke away from a one-all tie in Game 1 to complete the straight-game sweep. 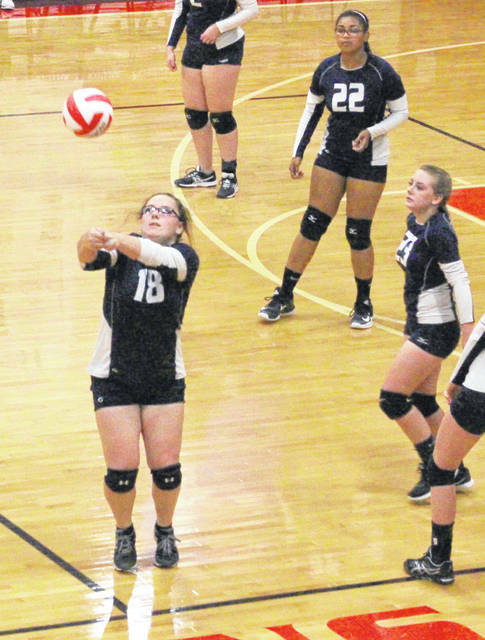 WHS also claimed a season sweep of the Lady Cats (3-15) after posting a 3-0 decision in Ashton back on Aug. 30 in the season opener. 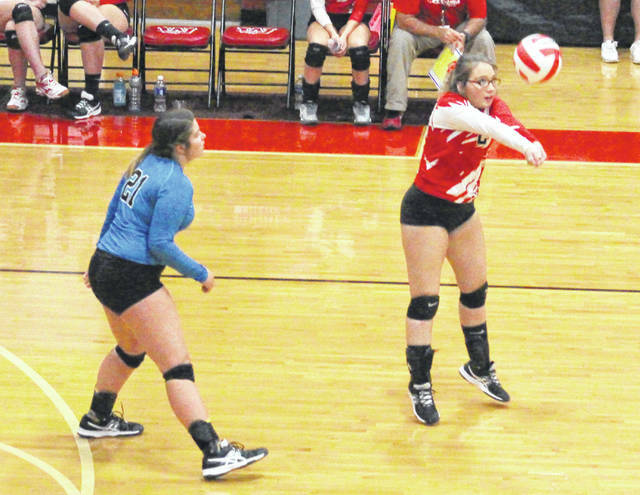 Wahama — which still has one regular season match scheduled at home — led by as many as nine points in the opener as the hosts broke away from a 12-10 contest by scoring 13 of the final 19 points for a 1-0 match advantage. The Red and White dominated Game 2 by storming out to early leads of 5-0 and 14-3, then reeled off 11 of the final 17 points en route to their largest win of the night — a 16-point triumph — while securing a 2-0 match edge. The Lady Falcons honored their four seniors — Madison VanMeter, Elizabeth Mullins, Hannah Wren and Destiny Sayre — between the second and third sets, then resumed play by jumping out to early leads of 4-0, 9-3 and 12-4. The Lady Cats clawed back to within 12-7 and 19-13, but Wahama ended the match with six consecutive points to wrap up the 12-point decision and the straight-game outcome. The Lady Falcons picked up their second season sweep of the year, just one season after winning only two matches all year. 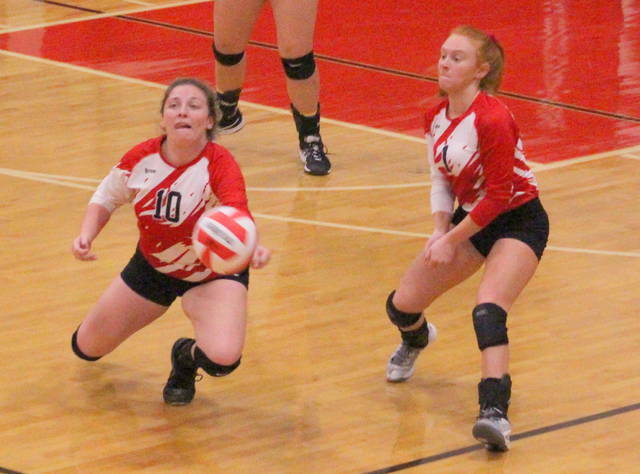 Wahama also swept Belpre in league play this fall. WHS coach Matt VanMeter admitted afterwards that it was nice to have an evening go smoothly, one that everyone could enjoy — especially those upperclassmen. Hannan dropped its third straight decision and fell to 0-3 against Mason County programs this fall, with another looming in the near future. HHS assistant coach Frankie Hudnall was mostly pleased with the overall effort, though it wasn’t perfect for the entirety of the match. Madison VanMeter led the Wahama service attack with 15 points, followed by Harley Roush with 11 points and Gracie VanMeter with nine points. Mullins was next with six points, while Logan Eades and Makinley Bumgarner respectively chipped in four and three points. Victoria VanMatre and Emma Gibbs each added two points, with Hannah Billups also scoring one service point. Bumgarner, Gibbs and Mullins led the net attack with three kills apiece, followed by Gracie VanMeter with two kills. Billups, Sayre and Madison VanMeter also had a kill each for the victors. Gibbs also had a team-best three blocks for Wahama. Baylee Hudnall, Josie McCoy and Hailey White had four service points apiece for the Lady Cats, followed by Halie Johnson and Jessica Dalton with two points each. Josie Cooper also had one service point in the setback. Dalton led the Blue and White with two kills and Johnson also recorded a kill. McCoy came away with Hannan’s lone block. 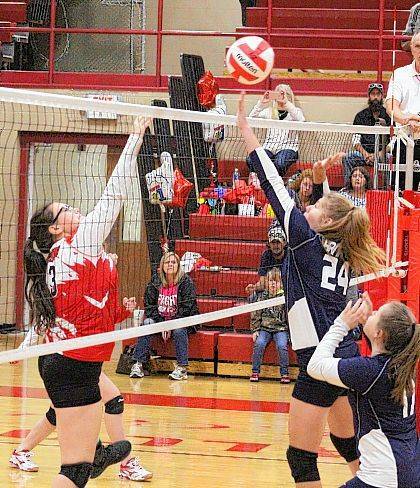 Wahama returns to action Thursday when it hosts a tri-match with Ravenswood and Huntington Saint Joseph at 5 p.m.
Hannan travels to Point Pleasant on Tuesday for a 6 p.m. contest.